‘The living past, the lost beauty of craft, the last in a family line’. ‘The Printer’ is a unique exposition of an 1850 printing house and shop that still operates today. It is world untouched by progress for 175 years and run by the last surviving member of the family business. 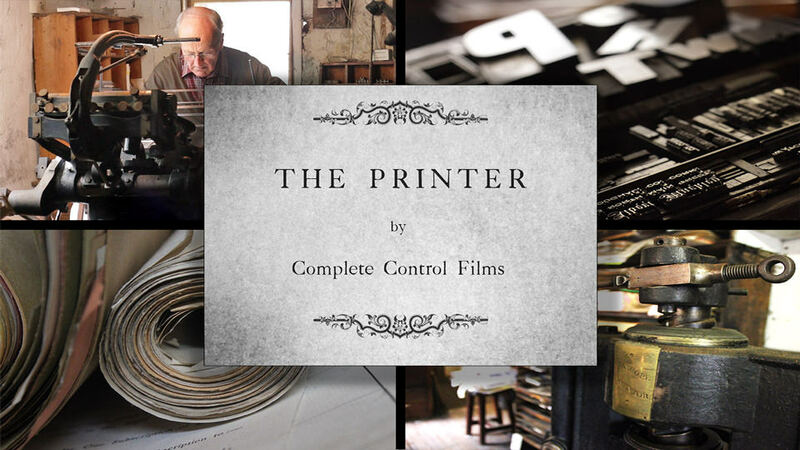 Complete Control Films (CCF) are very proud to announce ‘The Printer’ exhibition at the Triskel Project Space, Cork. The exhibition and documentary premiere will launch on January 27th at 7:30pm and will run until March 26th 2016. The centerpiece of the exhibition will feature a short documentary, a photographic gallery of images taken during the making of the film and posters and house artefacts from Field’s Printers, Youghal. Complete Control Films began filming Field’s Printers during the summer with the kind permission and assistance of owner, William (Billy) Field. The 15 minute documentary explores the printing process and the history behind the building. Hundreds of photographs were taken with a number of these to be displayed at the exhibition. CCF Director, Michael Twomey explains. “Kieran (McCarthy) and I had an idea a number of years ago to film some old shops and Field’s was an ideal place to start. It’s a beautiful place and very, very unique. I think it might be the only one of its kind still operating in this way in Ireland, if not further abroad. Billy (Field) couldn’t have been more helpful and we were amazed at the beautiful work that has been done there. It was a filmmaker and photographer’s dream and Kieran has done a fantastic job. An exhibition like this is great for Youghal because it again shows the richness of the town’s heritage, and one that can’t be found anywhere else. We often take heritage for granted so I hope the exhibition will help us and others appreciate what we have. We are thrilled that Triskel have got behind the film and created the exhibition.” Art Director of the Triskel, Tony Sheehan, also a Youghal man, is the driving force behind the exhibition. “It’s an impressionistic, poignant and beautifully made documentary on the shop that also features interviews with its owner William (Billy) Field and his reflections on his life in the town of Youghal. The exhibition also includes photographs made by Kieran McCarthy and some unique artifacts from the shop itself, including Posters, Printing Blocks, Woodcuts, and Letters,” he said. Further details about the ‘The Printer’ exhibition and its launch will be available in all media outlets in the coming weeks. Michael Twomey speaks with Judie Russell on Irish TV about The Printer – Documentary & Exhibition running at Triskel Project Space, Cork from January 27th to March 19th 2016. The living past, the lost beauty of craft, the last in a family line.